Perhaps you know how to pick just the right Oregon Pinot to complement your meal. But can you choose a craft beer that does the same? If not, you’re missing out on a world of delicious flavor pairings, according to two leaders in beer cuisine who happen to call Oregon home. At Pelican Brewing Company on the North Coast, Brewmaster Darron Welch and Executive Chef Ken Henson have been refining and elevating the art of beer and food pairing for years. Executive Chef Ken Henson and Brewmaster Darron Welch discuss pairing concepts with a U.K. Travel Channel host. Most people are aware that wine can bring out the best in food, and vice versa, Henson says. Yet with beer, the possibilities are far greater. 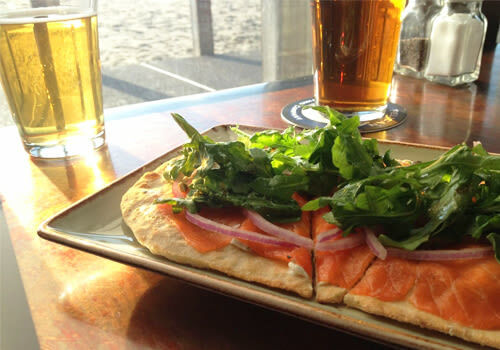 At Pelican’s flagship beachfront pub and brewery in Pacific City, a lager, ale or stout is listed beside every menu item—even the salads. The pairings are carefully calibrated by Henson and Welch to allow both beer and food to shine. For example, Pelican’s roasty, full-bodied Tsunami Stout can more than stand up to the award-winning Clam Chowder, while the Smoked Half-Chicken, brined in MacPelican’s Ale, is even brighter when accompanied by a zippy, clean Umbrella IPA. Pelican’s beers, in contrast, are designed to be flavorful and well-balanced, he says. It’s that mix of complexity and drinkability that gives Welch and Henson so many options for pairing the beer and food that they create. Pair flatbreads and beer depending on your toppings. 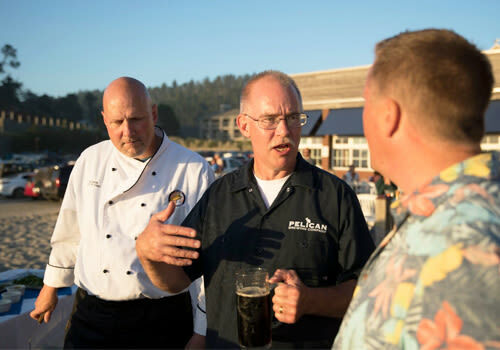 In addition to the year-round menus Pelican’s brewpubs and taprooms in Pacific City, Tillamook and Cannon Beach, beer cuisine has been showcased at Pelican’s Brewers Dinners for more than 20 years. To prepare the menus for dinners each January, April, October and November, Henson and Welch work together to create an “arc of experience within the dinner that says something with our food and beer,” Welch says. One of Welch’s favorites pairings is Henson’s Dungeness Crab Quiche with a Kiwanda Cream Ale. The floral notes in the ale enhance the natural sweetness of the crab, while the delicate pastry flavors of the quiche highlight the malt tones at Kiwanda’s foundation, he says. 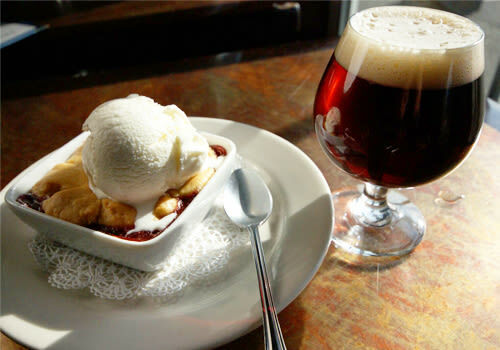 Even dessert can be paired with the right craft beer. How can home cooks emulate the beer and food pairings that distinguish Pelican’s menus? Henson says to start by determining what it is you like about a dish. Then search for a beer that offers similar, or parallel, flavors that will complement your food. If you like your steak with a nice char, for example, look for something dark and roasty, like a full-bodied stout. As you become more adept, try serving multiple courses, each with a different beer pairing. If one course incorporates parallel flavors, alternate with a course that plays the food and beer off each other, capitalizing on their contrasts. For example, soften the bite of a radicchio salad with a velvety cream ale or crisp Scottish-style ale. Discover more about Pelican Brewing Company at pelicanbrewing.com.